The agreement related to the Construction of Fishery Port (Marine and Road related works) Sheikh Dr. Salim Saeed Al Fannah Al Araimi - Chairman signed the agreement on behalf of the executing company, Galfar Engineering and Contracting. 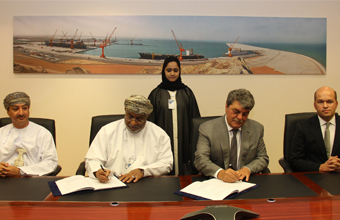 The signing of the agreement on the establishment of the fishery port in Duqm is part of the government's plan to make SEZAD a major center for fishery industries in the Sultanate. The port is the largest fishing port in Oman with an area of ​​600 hectares. It includes fisheries industries area with a group of factories and establishments specialized in fish manufacturing and canning. The cost of the project shall be about OMR 60.7 million and construction period shall be within 30 months from the commencement date in addition to six months for preliminaries. The port includes breakwaters with a total length of 3.4 km, a fixed pier for fishing purposes of 850 meters, and a fixed pier for ROP of 50 meters. Project works shall include dredging the harbor basin up to 6 meters, land reclamation to construct port service buildings. They shall also includes a tourist area with a wharf, pontoons, 5 floating moorings for fishermen pier with pontoons for Coast Guard, a crane for boat to maintenance, ramp for boats, marine services and facilities, service buildings, internal roads, parking lots and maintenance and repair workshops. The fish industry area in Duqm shall include 60 fish manufacturing facilities, cooling and freezing stores, and ship maintenance and repair workshops. The area aims to encourage fish farming, attract projects that add good value to SEZAD, conduct research on fishery sector development at an equipped research center in addition to various qualification and training centers.